Royal Blood | Do You Hear The Music? Everyone’s favorite rockers of 2015 are back again and this time with a new track used in the HBO series, Vinyl. Give a listen below to Royal Blood’s “Where Are You Now” and get ready to nod your head up and down. Rock on, friends! And you know what, he’s right! The UK duo of ‎Mike Kerr and Ben Thatcher absolutely destroy it on stage together. If you are a rock and roller, this is the one show of Life is Beautiful you cannot miss. And bring your earplugs because it’s going to be loud, in your face and righteous! Life is Beautiful 2015 Linep Is Here!! 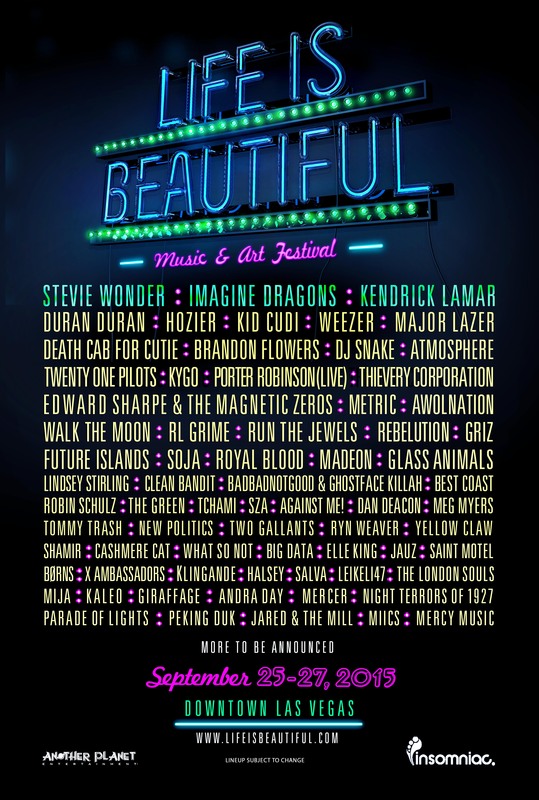 I’m very happy and proud to share with you the 2015 Life is Beautiful Festival lineup! We released the lineup earlier this week and the feedback has been tremendous. I truly hope you like this year’s collection and find both artists you love and artists to discover. While putting together the lineup I usually go a bit silent on DoYouHearTheMusic.com but now I’m ready to unleash a fury of new music for your ears, get some posts up of some of the baby bands on the Life is Beautiful lineup and a whole bunch of other fun things! Tickets to Life is Beautiful are on sale now! I hope ou pick up a pair and make plans to head to Downtown Las Vegas for what is going to be an amazing weekend of peace, love and music! What a year it was for me in music. So good that I don’t want this year to end but excited to see what 2015 has in store. Below (in alphabetical order) are albums I was digging in 2014. I couldn’t limit myself to a number and I know I missed some too but here it is. What were some of yours from 2014?